The senior officers of the Military Medical Training Centre, attendees of the 8th class of reserve medical officers on voluntary military service, cadets of the MMA Medical Faculty, University of Defence, teachers of organizational units, officers of the MMA management and heads of organizational units of the Institution participated in the exercise. The exercise was observed by the representatives of the Defence Ministry of People’s Democratic Republic of Algeria. The commander of the exercise Lt Col Dr Dragan Djordjevic pointed out that the objective of the exercise was to show the theoretical knowledge and skills the attendees of the 8th class of reserve medical school acquired in treatment of the injured and ill as well as the commanders of the exercise “Autumn 2015” to exercise management and commanding of mobile medical teams in natural disasters. Participants of the exercise practice to render medical support to the injured and ill during the last seven days, also the development of the medical stages in tactical units and to organize the management of the injured and ill in natural disasters such as an earthquake. 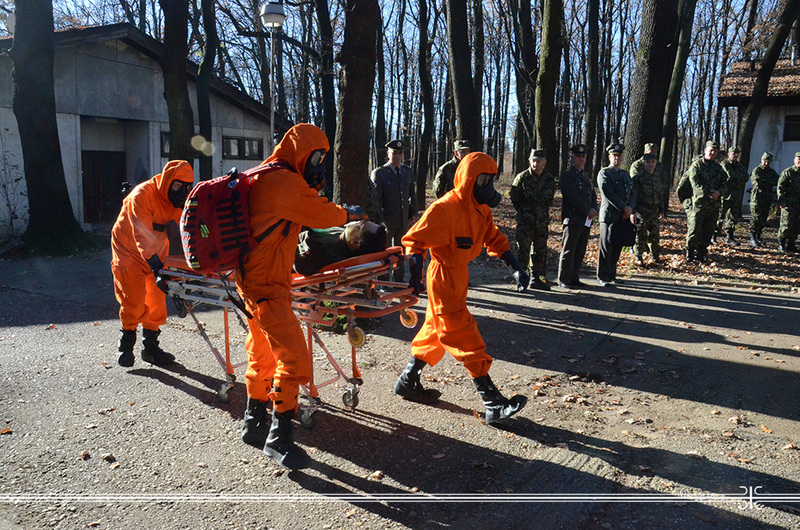 The practical part of the exercise was carried out at six points: leakage of gas and toxic agents from the chemical plant - management of the consequences and the poisoned as well as monitoring of mobile toxicological team, then the activity of joint preventive-medical team in the area affected by an earthquake, the activity of joint psychological-psychiatric team, the activity of surgical mobile teams during the management of the injured was shown and the last point was the medical reception and the air evacuation. Summoning the impressions, the deputy Head of the MMA Colonel Prof. Dr Dragan Dincic said that the exercise was useful for young physicians and that it should be the starting point for them regarding further activities.